Seeing this piss me off a lot! But, then I remembered that our phone are just mini computers. What we see on them are mostly layouts and themes/operating systems. Those layout and themes/operatin systems is what make us like the phone. It’s all programing, anyone(if you’re smart enough) is able to program a BB to run windows mobile or an iPhone to run RIMS OS. While doing my hourly browsing(iPhone edition), I decided to check out what was new with The Hundreds. 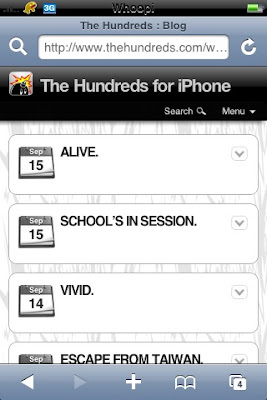 Well it looks to me that The Hundreds has updated their site so that it can be compatible for iPhones. What does that mean?!? Well it means that you can browse the blog at least 5 times faster than you could with the normal site. It’s good to see the site taking it to the next level with mobile(iPhone) browsing. 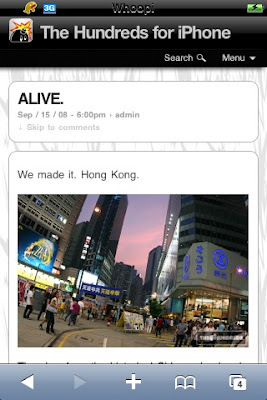 Check out the screenshots below of the iPhone version of the site. Maybe that’s wussup with those apple ads on the site.